These are SO good. Wow. I just might have them again for lunch today. And healthy. My favorite method for moist salmon is to set the oven to 350 degrees. Place the salmon on a "fish only" silpat in a sheet pan, salt and pepper generously. When the oven hits around 200 degrees put the fish in. Set the timer for about 20-30 minutes depending on size of salmon fillet. Start checking after about 3/4 of the time has elapsed. The salmon is done when the thickest part feels semi firm. You could also check with a fork if you are unsure. This honestly is the best way to do it, as it doesn't have a tendency to dry out even the thinnest of areas. Chop well in mini food processor until it is mixed well. Because this doesn't have oil you will need to use it immediately or freeze the remaining in a ziplock bag, air removed. Preheat oven to 350 degrees. Mix salmon, pesto, almond meal and part of cheese. Finish mixture with a salt and pepper. It will seem a little dry, but trust me on this, it will be fine. 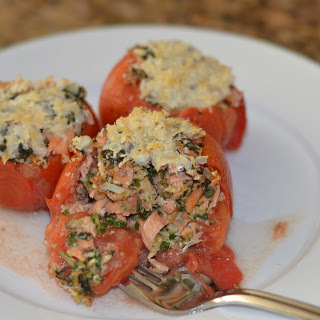 The moisture from the tomato and the healthy oil from the salmon will create a perfectly moist filling. Core out tomatoes and fill them with mixture. Top with remaining cheese and cook for about 15 minutes.